Matchbook combines the best in both public school turnaround expertise and blended learning expertise. As a non-profit charter management organization that targets underperforming schools with a competency-based, technology enabled turnaround model, we bring together some of the country’s leading practitioners in engagements involving lead turnaround partners, blended school design and implementation and coaching of master teachers. We have brought this tri-fold experience together to target school turnarounds with a customized blended model that blends face-to-face and virtual instruction in brick-and-mortar schools via a 1:1 computing environment, while coaching teachers to personalize instruction for the benefits of each and every child in their classroom. 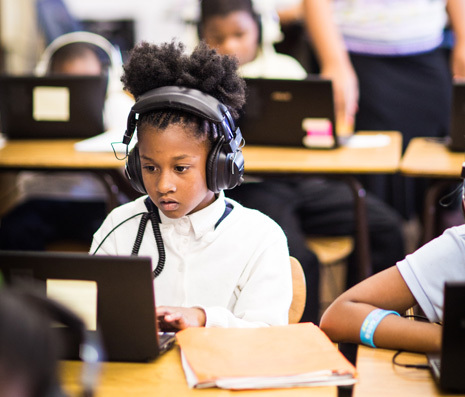 Our unique and innovative blended turnaround school model is the first of its kind in the nation to be offered to schools with the highest poverty rates and needs.